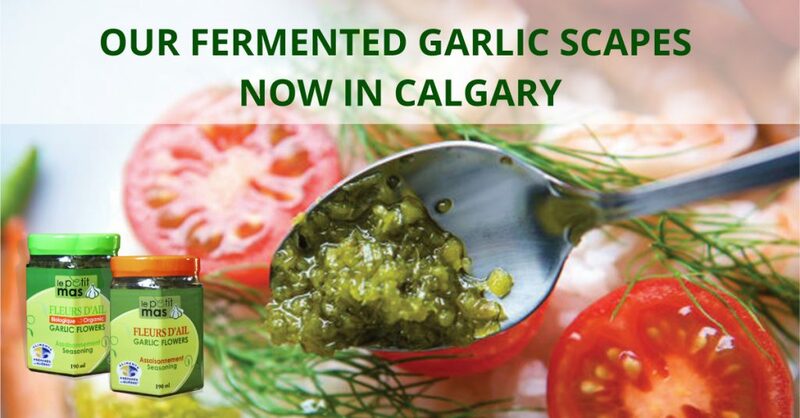 We are proud to announce that our fermented garlic scapes are now available in Calgary in different stores (see the list of the sales points at the end of this article). What are fermented garlic scapes? Our fermented garlic scapes are a unique seasoning that enhances any dish! Easy to digest and leaving no garlic breath, fermented garlic scapes are the ideal seasoning for your everyday meals, lunches at work or special party dishes. Practical, they are ready to use. Versatile, you can use fermented garlic scapes in any recipe when you feel like adding a delicious extra touch! Delicate, fermented garlic scapes enhance your recipes without overpowering other more delicate flavours. How to use fermented garlic scapes? Use 1 tsp. 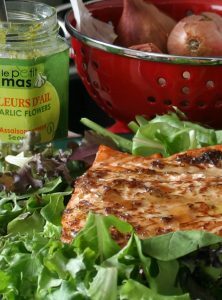 of Le Petit Mas fermented garlic scapes to give a special touch to all your recipes for pasta, seafood, salads, steamed vegetables and dressings recipes. See our recipes for inspiration. As they leave no garlic breath and are really easy to digest, you can use fermented garlic scapes instead of garlic: calculate about 1 tsp. of fermented garlic scapes per clove. Our fermented garlic scapes pack in a lot of taste with no added sugar or salt, allergens, cholesterol, gluten or lactose! They’re perfect for every diet! Click here to see the ingredients list, nutritional information and allergy certification. Garlic scapes or garlic flowers? When we began farming garlic in Quebec (Canada) in 1989, garlic scapes were very rarely used and commercialized. So we began using the term “garlic flowers” instead of garlic scapes and have since grown fond of it! 1) It keeps the products alive and good for your health. 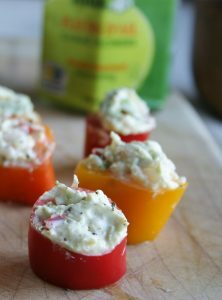 2) It preserves the vegetables for several years through an entirely natural process. Once opened, you can keep your fermented garlic scapes jar in the fridge for up to 2 years! We bet that you’ll finish your jar well before it expires! 3) It creates new flavours, which is why our fermented garlic scapes are so good! This entry was posted in Agribusiness, Garlic scapes and tagged Calgary, Garlic scapes, Points of sale by Laurie-Anne Dubeau | Le Petit Mas. Bookmark the permalink.